This post describes the best way to convert date or time values into numeric time values that can be used in Eureqa. Eureqa can only store date and time values as numeric values (e.g. total seconds or total days). Therefore, you need to pick a reference point to measure a time duration from, and units to measure the time duration.For example, you could convert a time value “8:31 am” to 8.52 total hours since midnight. Similarly for dates, you could convert a date like “Dec. 6, 1981 8:31 am” to 81.9 total years since 1900. You need to make date and time conversions to numeric duration values in another program like Excel before entering into Eureqa (see below for example). 1) Do not concatenate date and time strings to get a numeric value. For example, do not convert a date like “1981-12-06” to 19811206. This representation of time is extremely nonlinear. It can preserve order, but has lost all meaning. Additionally, the values are very large and numerically unstable. 2) Avoid measuring time durations from a very distant reference point. For example, if you’re data uses time values that span a few days, do not convert these time values to total seconds since the beginning of the century. The numeric values would be enormous and numerically unstable. Instead, the best practice is to measure a time duration since the time point in your data set. and then repeated for all rows, would subtract the first date in cell A0, and multiply the resulting day values into hours. and repeated for all rows, returns the fractional value of years from cell A0. A time delay retrieves the value of a variable or expression at a fixed offset in the past, according to the time ordering or index of each data point in the data set. This post describes the time-delay building-blocks available in Eureqa and different modeling techniques with delayed values. Eureqa provides the delay(x, c) building block to represent an arbitrary time-delay, where x could be any expression. 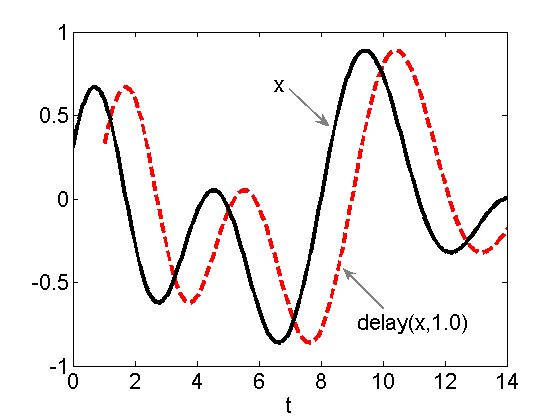 The expression delay(x, c) returns the value of x at c time units in the past. When used as a building-block, Eureqa can automatically optimize expressions or variables to be delayed and the time-delay amount c.
The figure above plots an arbitrary variable x and a delayed value delay(x, 1.0), where the values are ordered by some time variable t. The delayed version is equal to x at 1.0 time units into the past. If you don’t specify a time variable, Eureqa will use the row number in the spreadsheet as the time value of each data point. If a particular delayed time value falls between two points in the data set, the value is linearly interpolated between the two data points using the time value. Eureqa also provides the delay_var(x, c) building-block which is identical to delay(x, c), except that it only accepts a variable as input. It’s provided as a special case of the delay(x, c) building-block to allow you to constrain the types delays used in the solutions. But in the end they are effectively identical. Notice that the delayed output plotted above does not have values on the left side of the graph for the first few time points. This is because these points request previous values of x that lie before the first point in our data set. 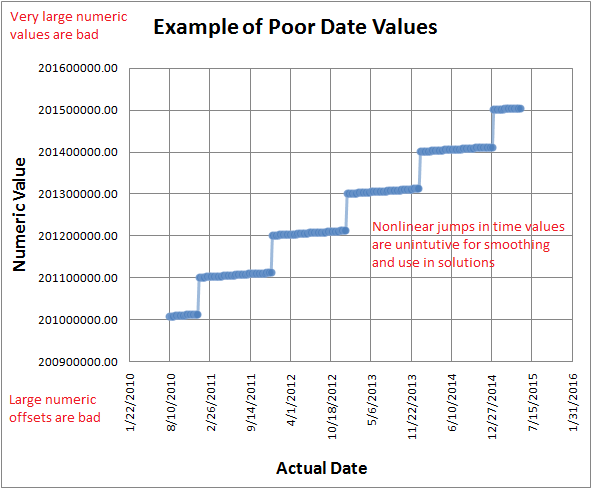 Eureqa will automatically ignore these data points when calculating errors. 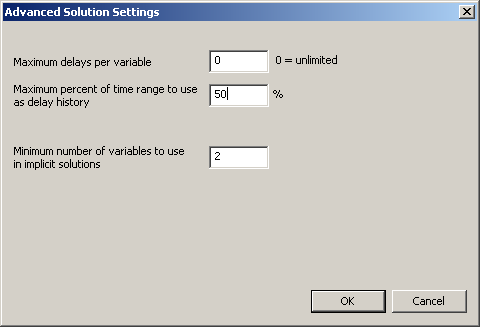 Additionally, you can control the number of delayed values per variable (including a zero delay of an ordinary variable use) in this dialog. 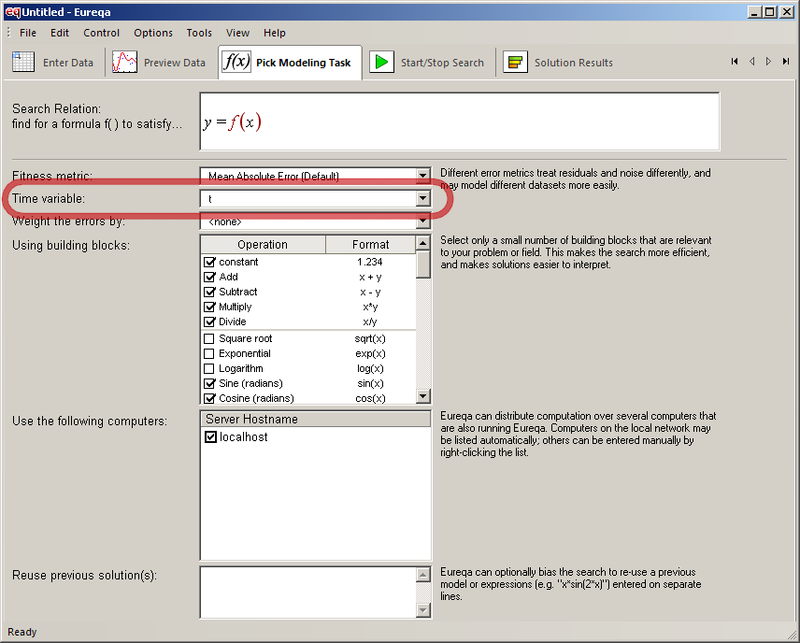 This search relationship tells Eureqa to find an equation to model the value of x as a function of it’s value at 2.1 and 5.6 time units in the past. Here, 3.21 is the minimum time-delay. Now, if the time-delay building-blocks are enabled, Eureqa can delay this delayed input further if necessary. Therefore, you most-likely want to limit the total number of delays per variable to one (which includes the zero delay of the normal variable use). You can set this in the Advanced Solution Settings menu. The default is unlimited. Implementing delays in Excel is a littler harder. 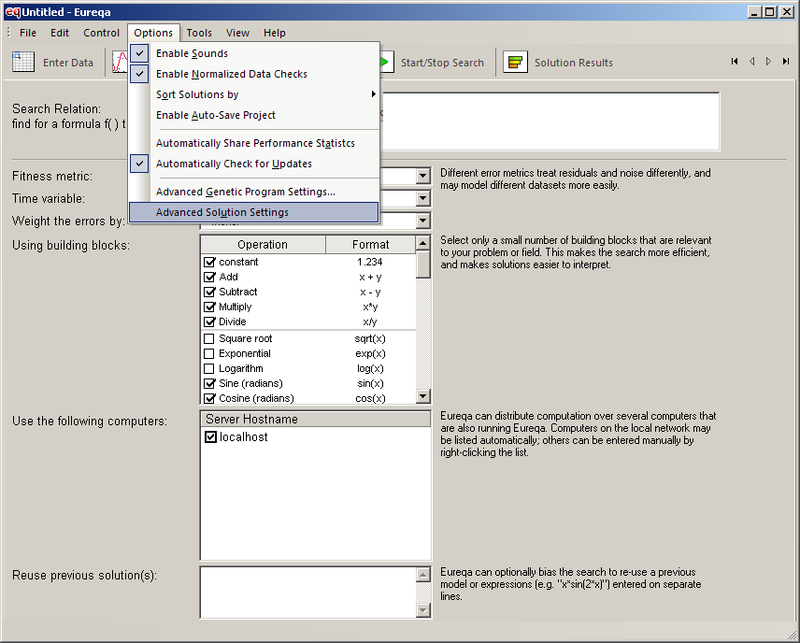 You need to download an Excel add-on that adds an interpolate function. For example, the package XlXtrFun adds a function “Interpolate” that is just like Matlab’s interp1. There are also other guides for Linear Interpolation with Excel.